I prefer to bulk our meals with more vegetables. When we do have meat, it's often sliced thinly or in much smaller quantities (our bolognese has finely diced celery, carrot and other bits thrown in). Our freezer isn't very large. It can get pretty expensive. 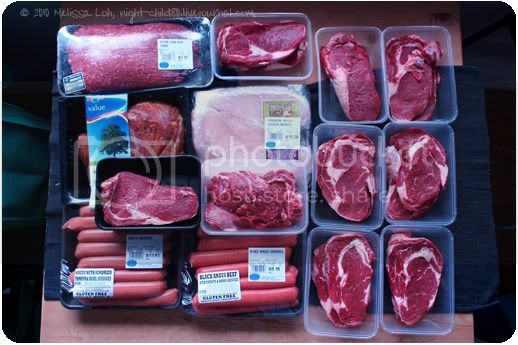 We have however discovered Super Butcher and purchased pork, extra lean mince, steaks and sausages from them. They're definitely cheaper than the major supermarkets and if you don't mind stocking up the freezer, they're the ones to check out. I would highly recommend bringing a sweater and wearing jeans though, cuz the whole place is a giant freezer. This is how much that quantity of meat looks like. Can anyone say HOLY COW?! Each container of steak holds 2 - basically a steak each for the SO and I. That's 9 meals, not including the freebies. The ribeye we picked was one of the smaller ones at almost 4kg and that cost us about $97. Don't worry, we also regularly purchase beef cheeks, tongue and other bits most people wouldn't think to cook. Nothing is wasted.